Anyone notice that more and more faux fabrics are emerging on the scene? It seems man made fiber fabrics are gaining popularity. What’s the reason for this trend? Well, faux fabrics are characterized as more durable and resistant to sun rotting. Another reason for man made fiber fabrics’ rise in popularity is that they’re usually less expensive than their counterparts. Other fabrics gaining in popularity are soft linens and plush velvets. We're now including "Tech Stuff" on our Dabbieri Blog so we can answer any of your technical carpeting questions. It might not sound that interesting, but it really is! Q: What’s the difference between an Axminster & Wilton carpets? Well, only about 10% of today’s carpets are woven. Axminster and Wilton are two types of looms used in the weaving process. They weave colored pile yarns and backing yarns together into a finished product that withstands heavy traffic. Axminster and Wilton carpets are known for their durability, strength, and firmness. The Axminster loom is capable of producing a wide range of patterns and colors; it is often used to create Oriental design rugs. Most Axminster carpets and rugs are single-level cut pile. The Wilton loom is a more versatile loom. Wilton carpets can have intricate patterns and styling, and a variety of colorations. 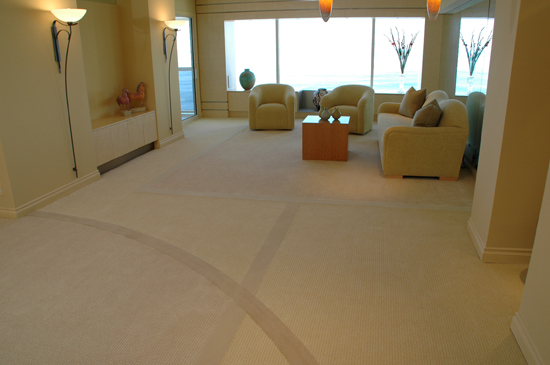 Wiltons can be manufactured as loop or cut pile carpets or a combination of cut and loop. I hope this helps! If you have any technical carpeting questions - you can post them in the comments section or just email us! Hey there! My name is Deborah Lamoureux and I'm a Merchandising Manager here at Dabbieri. I thought I'd share some of my thoughts on current hot colors. • Black and whites with accents colors such as red or green or even hot pink! • Metallic golds and silvers are gaining more and more popularity. • Spa blues and greens are still in. • Violet red purples are coming up on the color horizon along with coppery orange colors. Designers - did you know that popular colors work on a sixteen year bell curve? It takes most colors eight years to get to the top of the bell curve to peak in popularity and eight more years to wane in popularity before disappearing completely. How are you using these colors in your interior designs? I'd love to know! In Dabbieri’s daily conversations with designers, we find that you really struggle with consistently charging clients for time spent on a job. So, we thought we'd seek out the expert advice of Lloyd Princeton, key Interior Design business consultant and owner of Design Management Company located in NYC. At the heart of Princeton’s discussion was his encouragement for Interior Designers to move away from charging customers for time and materials, and instead charging a design fee based on the designer’s experience and the complexity of the project, as well as time. “Establish fees that value your artistic abilities and experience, rather than solely relying on time billing or sales commissions,” said Princeton. • The Interview Process - Tip: Use your portfolio to sell your talent. Don’t give away your ideas for free! • The Bidding/Proposal Process - Tip: Letter formats are more approachable – but it’s important to be very specific! • Negotiations - Tip: Remember that Interior Design is a luxury service - you should charge accordingly. • How To Close - Tip: Show your enthusiasm and remember to explain why you want the job. I hope these tips help you to stop giving away your time and start charging what you’re worth! Victoria Dunivin of Dunivin Design Group in San Diego, California, is a 22-year design industry veteran known for creating beautifully unique spaces like the interior featured above. Dunivin’s goals were to create character and scale within a beautiful high-rise apartment overlooking the Pacific Ocean. However, her designs were handcuffed to some strict rules. “I wanted it to be sophisticated, subtle and something you wouldn’t see anywhere else,” said Dunivin. Initially wanting to mix carpet and hard surface, Dunivin learned that building rules would prevent her from using hard surfaces. Still determined to introduce more variety in look and texture to the room, Dunivin soon found her design inspiration at M. Austin Designer Floors, a local San Diego floor covering showroom. Dunivin and her client focused on three carpets, two in patterned colors that were warmer yellows, paired with some velvet cuts and another in more grayish tones. Dunivin remembers, “The client and I liked all of the carpets, then my client said, ‘I can’t choose, so why don’t we use them all?’” Dunivin loved the idea and knew it would be key to helping her take the long shoebox room and visually define and separate the dining and living spaces, without being able to use hard surfaces. Dunivin managed to accomplish it all.